The Big News: Hideo Itami laid out Bobby Roode for the second time with a Go to Sleep, just three days before their title match at NXT TakeOver: Chicago. 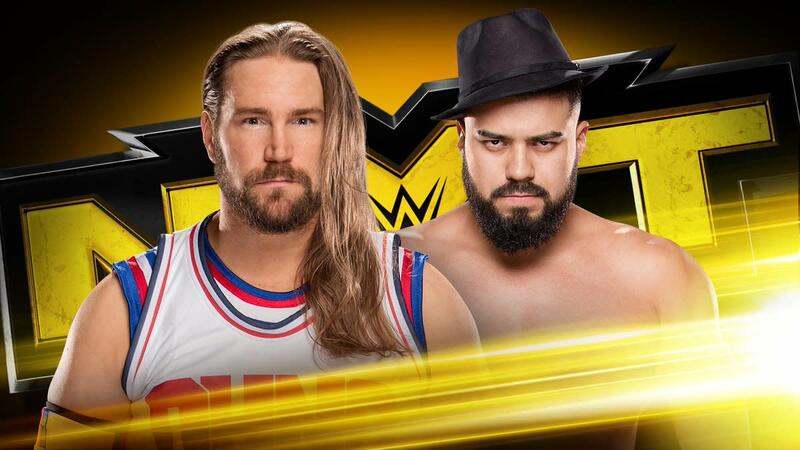 The Medium News: Kassius Ohno beat Andrade “Cien” Almas in a match between two men who will not be on TakeOver. The Little Beaver-sized News: This really was a poor build to TakeOver, huh? Bobby Roode arrived at Full Sail University earlier today and yelled at the man carrying his bags to go faster. Last week McIntyre was confronted by Wesley Blake, which theoretically set up a match this week. However, in case you are confused, Maluta and Blake are two different people. The fans recognized that Maluta had no chance in this match and did not care at all for his offense. He hit a Codebreaker off the middle rope and it barely got the fans to raise their eyebrows. McIntyre got a welt under his eye, perhaps from a punch, perhaps the Codebreaker, but won with a Sick Kick. Kayla Braxton came out and asked McIntyre if he's concerned about having the attention of Blake. Shockingly, McIntyre was not concerned, however he did challenge Blake to a match next week. 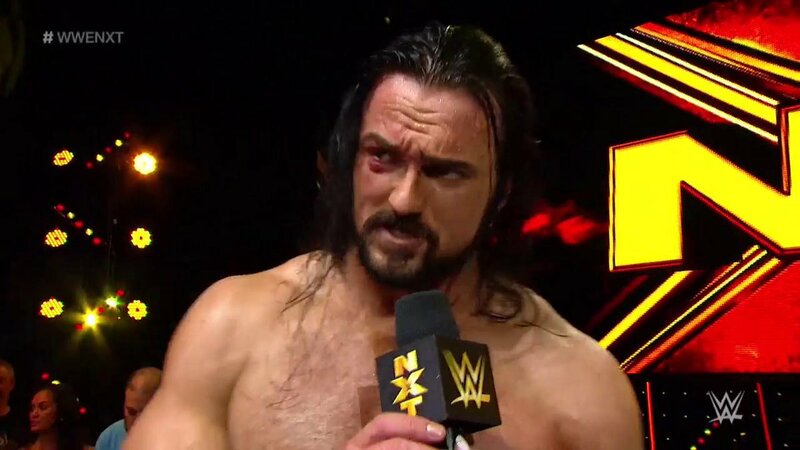 We got exclusive footage from after NXT last week, where SAnitY attacked Roderick Strong after his match with Hideo Itami. Backstage, Strong told Mr. Regal he wanted SAnitY. This led to an Eric Young promo where he called Strong crazy for challenging them to a fight at TakeOver. Young accepted the challenge, so we have a match for Saturday. We got a video feature for Itami, showing his debut at NXT TakeOver: Fatal Four-Way in September 2014 where he single-handedly beat up The Ascension. That was a bigger deal then since it was the same night they lost the tag titles after 364 days. We got a video package for Tyler Bate vs. Pete Dunne, showing clips of their match from the UK Championship tournament finals in January. Shockingly, they had new interviews with both men. I am so used to watching the same two video packages that I nearly had a heart attack. "The Velveteen Dream" Patrick Clark is still on his way. He has a long way to go to match Nia Jax's record for the longest build up to their debut. Another Itami clip aired, this time showing him beating Tyler Breeze at the WrestleMania 31 weekend NXT show. 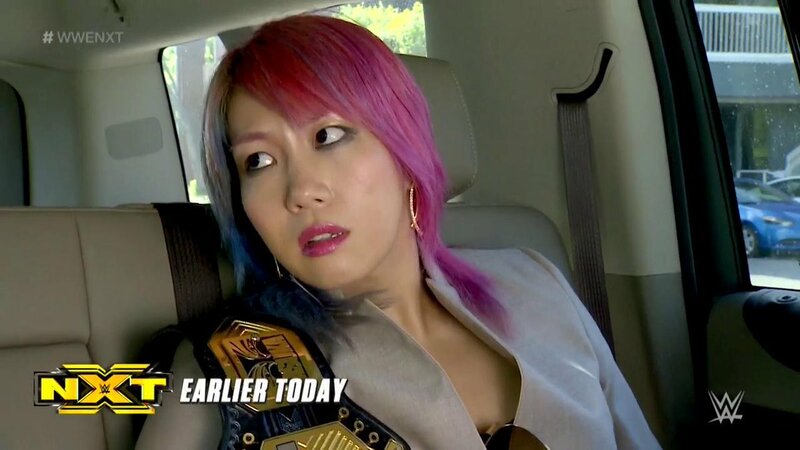 Asuka was being driven to the arena earlier today and being asked stupid questions. She acknowledged they are stupid questions and kept saying “next question.” Asuka arrived at Full Sail and took a selfie with the fans. That was nice of her. Lacey Evans, who is a former military member, was here to face Sonya Deville, who used to be Daria Berenato of Tough Enough fame. The fans were not into this match except to yell “sweeeeeeet” after every two count. Deville used a takedown and locked on a body scissors. She just bullied around Evans, who is much bigger than her. Evans finally blocked a strike and hit a bad looking punch to take over. Deville came back and won with a step-up enzuigiri. We jumped forward to Itami returning to NXT last month and laying out Bobby Roode with a Go to Sleep. It was then time for the main event of the show. Ohno's gear was based off the Orlando Magic's jerseys from the early 1990s. Ohno ran wild for three or four minutes to kick off the match, but Almas got the heat when Ohno caught himself on a dive attempt when Almas moved, but Almas booted him right in the mouth. This was a good back-and-forth match. There is something still missing with Almas. He's so much better as a heel, but there's just something not there. Almas hit the double knees in the corner, but instead of going for a cover, he picked Ohno up, which led to his undoing. Ohno fired up after an inverted DDT, hitting a pump kick and two rolling elbows to pick up the win. Itami had yet another video, this one looking at his match with Strong from last week. We were joined by the "Glorious" NXT Champion, Bobby Roode, to end the show this week. Roode did not take his time to walk to the ring, getting it done in only 40 seconds. Roode said that he is a man and can admit that Itami knocked him out with a Go to Sleep a few weeks ago. Mind you, he told the story that he was in the ring minding his own business when Itami walked out and did it unprovoked. Roode said that will never happen again, and this Saturday he won't be standing in the middle of the ring in a custom-made suit, he'll be in his gear and prepared to do what he's done to everyone. That's beat them, embarrass them, and make an example out of them. He brought up Itami constantly getting injured and being out for a long time to the point where Roode didn't even know he worked there anymore. Roode said Itami will have to go back to Japan and tell his wife and kids that he failed again. But this time he failed because of Bobby Roode. Itami came out and was dressed like someone who just wrestled an hour ago. Mr. Regal and a bunch of security tried to convince him to leave, but Itami flew past them to get to the ring. Itami beat on Roode until security pulled him off. Roode ran for cover as Itami laid out two of the security guards with a Go to Sleep. Roode rolled back in for the sneak attack, but Itami cut him off with a Go to Sleep! That does it for this week. This Saturday is NXT TakeOver: Chicago, and until then, remember to say your vitamins and take your prayers!